Another 4:30am morning. Woke up, packed up, and despite that I don't eat spicy, Bo, Kilik and I all had Korean Noodle Soup (辛拉麵). Just wanted to make breakfast easy for everyone so I stuck with party lines. 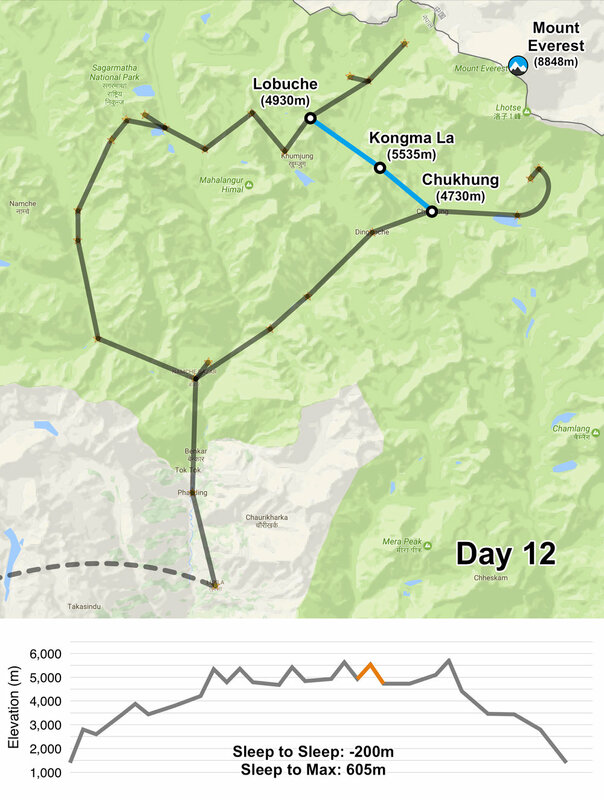 Recall that Lizhen and Longshen decided to no do the high pass and go the longer, flatter and lower elevation route through Dingboche. It was still pitch dark when Bo, Kilik, Sanu, Pemba and I started heading out, but I was way too drained to do any candid shots until the sun got up. 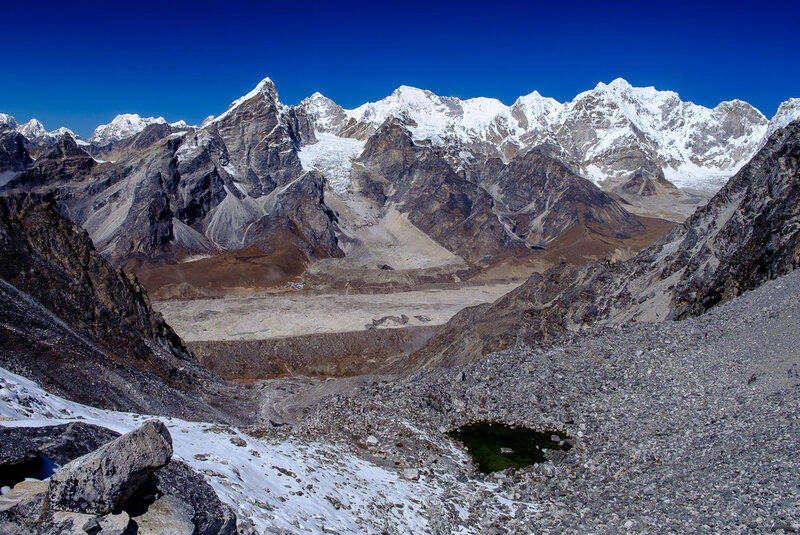 So the following pano was taken just before we were past the Khumbu Glacier. All in all not many photos at all were taken on this gruesome grind up to the Kongma La pass. I was extremely exhausted, and the struggle with the thin air continues. Even to this point, KIlik and Bo both seemed to have acclimated much better than I did, and I was much much slower than them in pacing. Each step was draining and a struggle. Only Sanu stayed back to make sure I was okay, while I very slowly ground up to the top. If not for the few wait/rest points along the way, I would have easily been a full hour slower than Bo and Kilik in getting to the pass on this otherwise 4 hours hike. I definitely would not recommend to anyone to have two 5,000m+ days back to back, especially if you have not been acclimatizing well to the altitude. From experiences through the previous days, I knew that I have always been the slowest one, but each and every time I have never failed to reach the objective. And this time was no different. 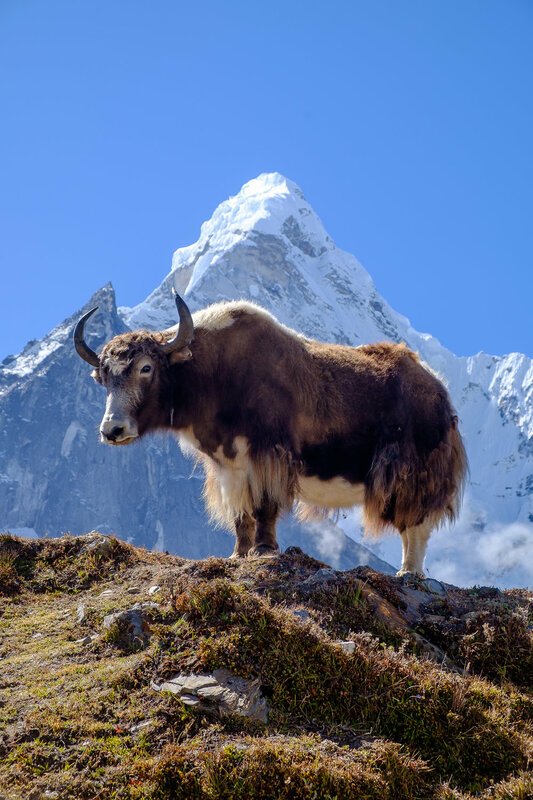 The slow and barely breathing Howard managed to complete all 3 passes of the Everest region! After photos and rest, we started to hike down towards Chukhung. Pacing was also extremely fast by Bo and Kilik. I struggled to keep up initially, before being completely lost by them. Sometimes I wonder why did we have to be in such a rush all the time? On some days we got to the destination by 2pm when the sun sets around 6pm. So I eventually gave up. I was much too exhausted, even for downhill, to muster up any sort of pace anyways. In my mind, what we should have done was to have a rest day between Kalapathar/EBC and Kongma La pass. So doing Kongma La pass slowly was a huge concession already. If not for how Sanu looked like he was growing rather impatient waiting for me, I would have gone even slower and took my time doing photos and resting. Eventually I reached Chukhung village by around 4:00pm. At a point I almost thought the route would never end . That made it almost 11 hours of trekking! By the time I arrived, everybody else were already there. At least it was a rest day the next day. There was gas heated shower there. So I jumped at the opportunity to take a hot shower before sinking in to Chukhung village for a much deserved rest day. REST DAY! Took the morning to do some laundering, sun-drying and charging through portable solar panels. After breakfast, we took the morning to explore Chukhung village and see what we can do to better prepare for attacking Island Peak. Tell you the truth tho, there really isn't too much around here. 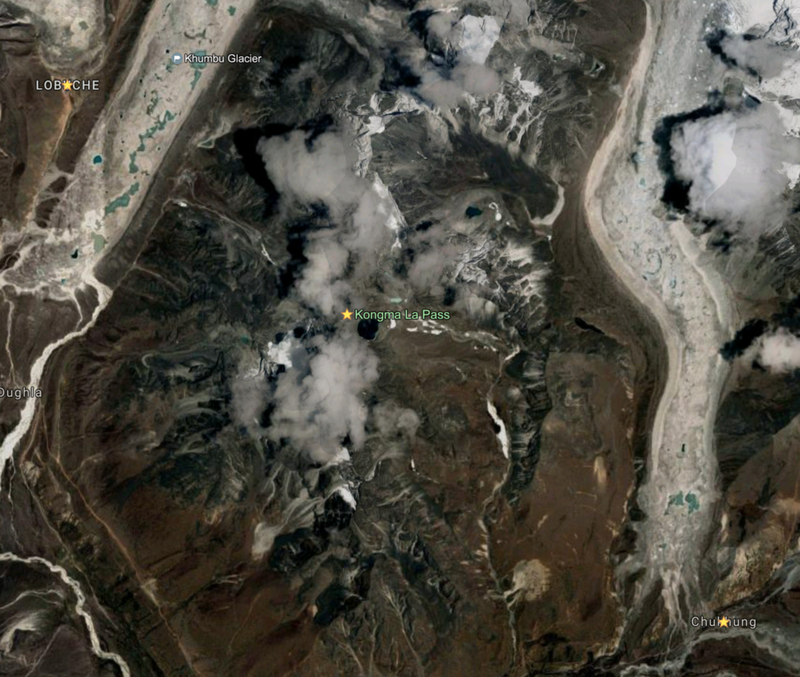 It's probably similar in scale to Gokyo/Lobuche. It's no Lukla/Namche Bazaar. We found one groceries store which we could not find a staff for over 15 minutes. There we found some made in Japan hand warmers! And then we found the following gear shop. We figured this could be a backup gear rental shop if what the climbing guides have for us doesn't work out. The shop owner wasn't very helpful tho. Basically said don't bother asking unless we actually want to rent from him right there and now. Nothing much happened for the rest of the day. It was a true rest day! When the sun starts setting, Bo and I ran out for some sunset photos. It was a rare day where the weather was great even until the evenings! We were lounging around the dining area when I figured that a clear sky for sunset should mean a clear sky for stars and the Milky Way! Longshen, Bo and I have had a tripod in each of our luggage for the entire trip but have never found a use for it. Perhaps tonight is the night! Looking up various apps for sunset time, sunset direction, and Milky Way positioning throughout the night, we figured that the best time was around 7pm. This is because towards winter in the northern hemisphere, the Milky Way is actually high in the sky during the day time. So the Milky Way would eventually no longer be visible later at night. The time right after sunset and right before the Milky Way also sets would be the only window of opportunity for photos. With tripod, headlamp and some warm jackets, I got the following photos~ I copied Bo's composition for this one. Milky Way by the Amadablam. Residual light from sunset still visible. 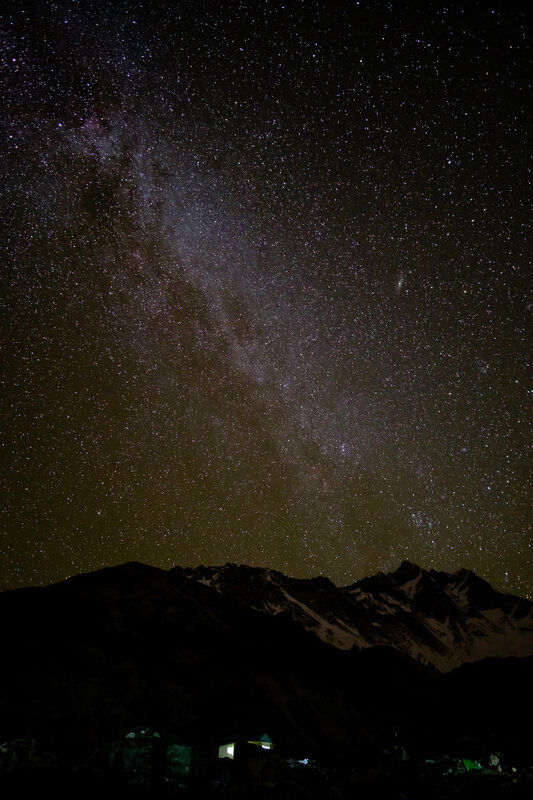 As you can see there are some light pollution because we weren't trekking far enough away from the Chukhung lodges. After dinner we met one of the two climbing guides for the first time. He told us when to wake up the next morning. 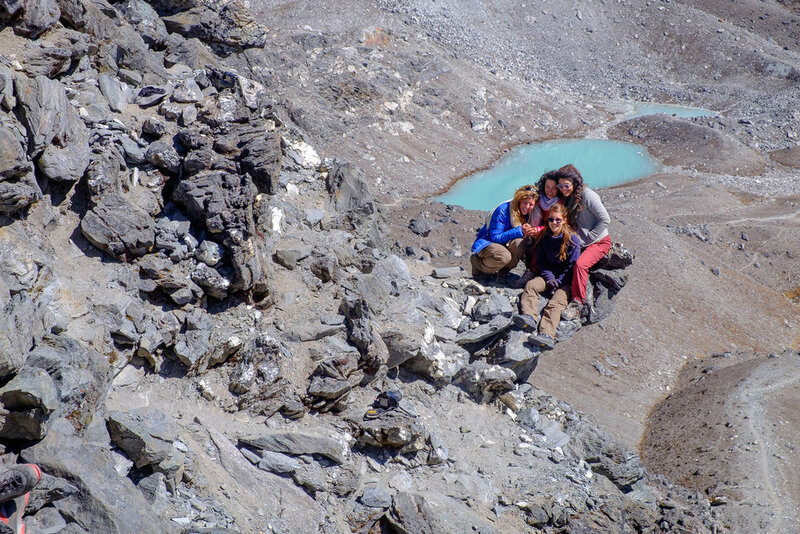 Which is when we would try on some mountaineering boots before setting out to the Island Peak base camp.